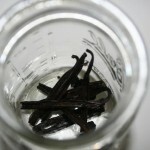 I love the flavor of a hint of vanilla in baked goods, but I use it sparingly due to the cost of true vanilla extract. 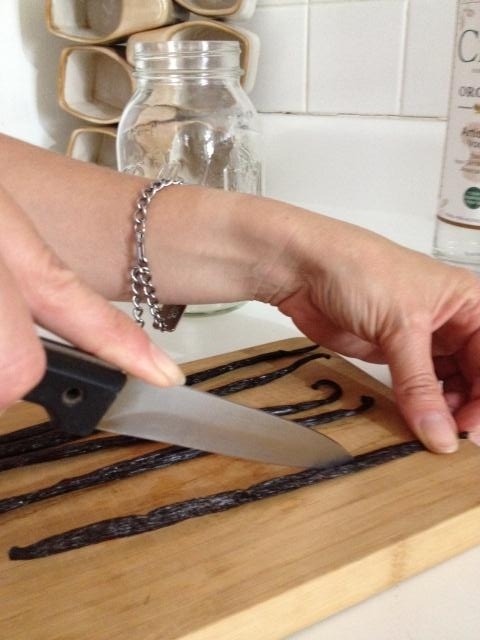 The price of fake vanilla extract is so much cheaper but filled with artificial flavors, color and preservatives – so why use it!? I wanted to know how to make my own – so off to the world wide web to find out and I found many recipes – all them really easy. 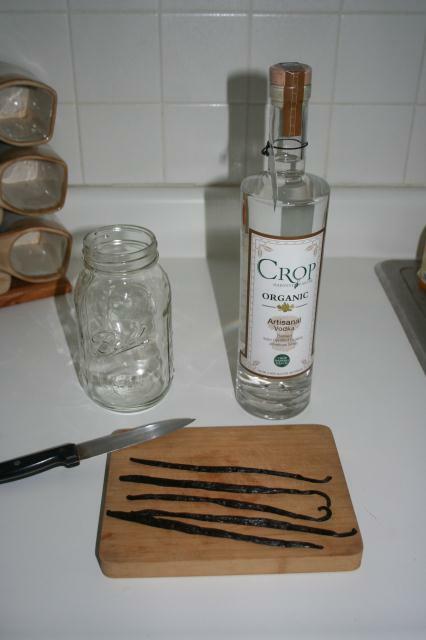 All that I needed was vanilla beans, vodka, mason jar and time – that seemed easy enough. I ordered Madagascar vanilla (on-line) and went to my local wine shop (they carry some other items as well) and purchased organic vodka. 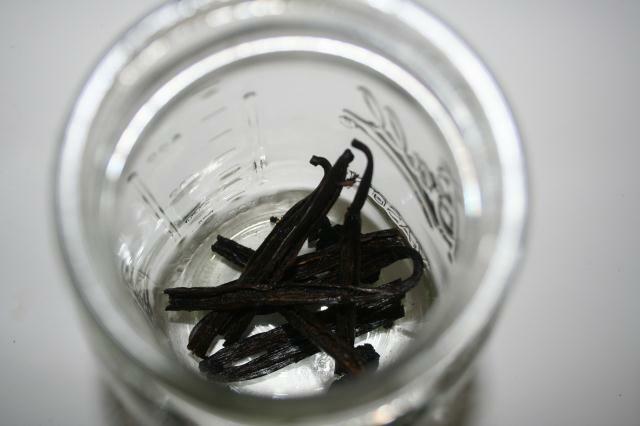 When the vanilla came in the mail we could smell it through the packaging! 1. 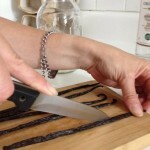 Cut your vanilla beans length wise with a sharp knife. 2. Scrape the sticky inside of the bean out with a butter knife and put in the mason jar. 3. Cut the vanilla beans in half and place them in the jar. 4. Pour the vodka into the jar, seal the top. 5. 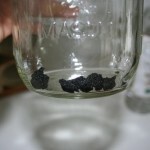 Place the jar in a cool, dark location and remember to shake once or twice a week. I marked my calendar, but you could also label the jar with the date you made it. It will be ready in 3 weeks. 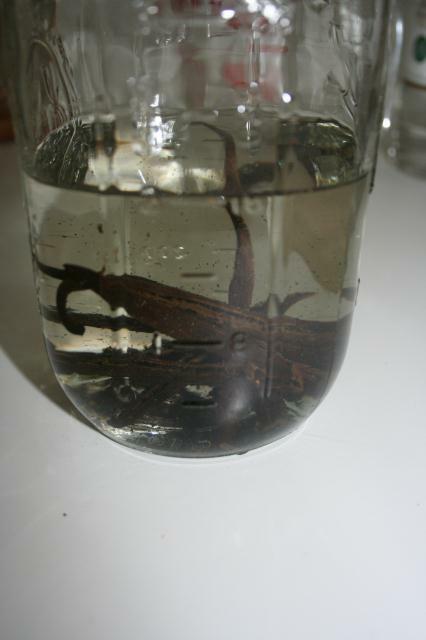 Your vanilla extract has a pantry life of about 8 months. I bought 4oz. brown bottles to pour and keep the extract in and to share with others. 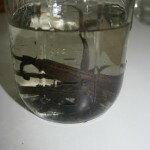 This entry was posted in Recipes and tagged vanilla extract recipe. Bookmark the permalink. Can you freeze it so it lasts longer??? I never read anything in my research, but would think you could since it is in vodka. When mine is ready I am going to take one of the 4oz. bottle and put it in the freezer to see – will let you know. What a great idea. Thanks for all your great research. 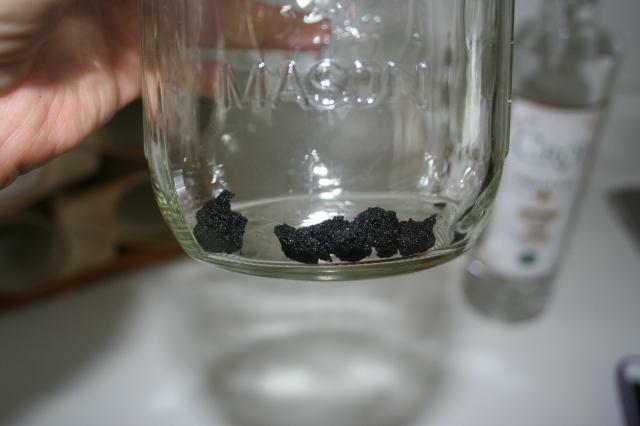 I Make my own as well and I have found to let it sit for 6 months before using, stronger flavor, and it will last indefinetly due to the fact that is is sitting in alcohol. Ever had Vodka spoil on you?